Where do I use my Northern Parrots voucher code? 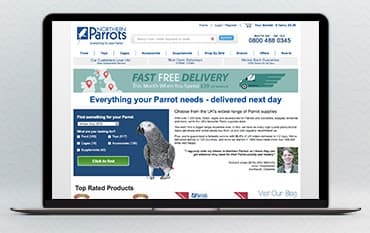 Find a code you would like to use on NetVoucherCodes, copy it and head over to northernparrots.com. Shop for your parrot's items and add them to the basket as normal. When you are ready to checkout click on 'View Your Basket'. Put your discount code in the box and press 'Apply' to add your discount to your order total. Click 'Proceed to Checkout' to continue with your order. Get exclusive offers and early access to any sales when you sign up to the newsletter. Check out the Special Offers section for discounted products and flash sales on brands. As the Uk’s favourite Parrot supplies store, you will find everything you need and more for your Parrot from toys, food, cages and accessories. Whether you’re shopping for your, Cockatiel, Budgie or lovebird to just name a few, you will find exactly what you’re looking for. With a wide selection of products to choose from, you will find everything you and your Parrot need. You won’t find a bigger range of high-quality products anywhere else. Northern Parrots provide products for many online stores and are highly recommended by many vets. Complemented with excellent customer service, Northern Parrots is guaranteed to make your bird very happy. There is a wide range of parrot accessories to choose from at Northern Parrots, so find your bird and get shopping! Parrot Supplies will show you all the food, toys, cages and accessories suitable for your bird. Everything you need for a healthy, happy parrot can be found right here at Northern Parrots. Kit your Parrot out with essential accessories and choose from a wide range of cages, feeding dishes and perches, Parrot harnesses, cleaning products, hideaways, UV bird lights and so much more. At Northern Parrots, you are spoilt for choice and are sure to find exactly what you need. You can return anything that you have purchased from us, for any reason, within 90 days of purchase. It must be returned in the same condition that you received it. Please use the returns note that you received with your order and enclose it with your returned item. Small and medium parcels up to 15kg can be returned free from any post office. Please visit www.royalmail.com/returns and follow instructions. You will need to print off a returns label. Items over 15kg will need to be collected from your home and there will be a minimum collection fee of £10 (cages will cost more). Please contact us to arrange this. Taking care of Parrots is very different from taking care of other pets. Make sure that Polly gets the necessary care as all the essentials like food, toys, cages and supplements are available through Northern Parrots. Snap up one of our Northern Parrots voucher codes and get a great discount on your pet supplies. This is the perfect place to look for accessories and supplies for other birds like perches, instructional books and bird lights.